The semi-final of the Emirates FA cup 2018-19 took place between Wolverhampton Wanderers and Watford. The match took place at Wembley Stadium. The match ended with Watford victory by 3-2. Wanderers lost the game, however, the match will be remembered for Raúl Jiménez putting on paying WWE wrestler Sin Cara mask to pay tribute to him. Rahul Dravid Mesmerized by Lionel Messi Magic at Camp Nou As Barcelona Defeat Atletico Madrid 2–0 in La Liga 2018–19, Watch Video. Raúl Alonso Jiménez Rodríguez is a Mexican professional footballer who plays as a forward for English club Wolverhampton Wanderers. 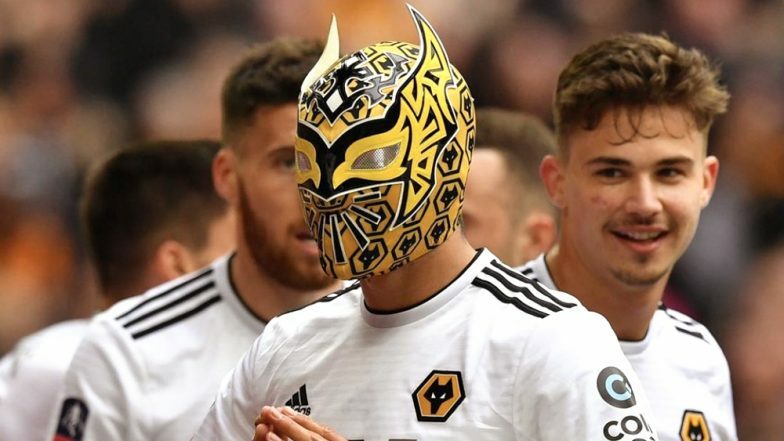 The Mexican footballer scored the second goal against Watford and he celebrated that moment by putting on a mask sent to him by WWE Wrestler Sin Cara. Jorge Arias known by the ring name of Sin Cara is a Mexican-American professional wrestler currently signed to WWE, where he performs on the SmackDown brand. Jiménez Rodríguez is currently being taken on loan by Wolverhampton Wanderers from Benfica. He will permanently join his current club on 1 July 2019. Rodríguez began his career in Club América's youth system before debuting in the first division in October 2011.